All surfaces must be thoroughly cleaned by either power washing or if required wire brushing. Years of grime, mould, algae and other contaminants are removed. All loosely adhered or delaminated paint work is removed. A process known as 'needle-gunning' may be required. This will identify any damaged render, brickwork, roughcast, pebbledash etc. 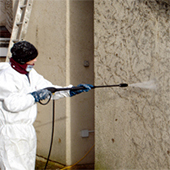 A biocidal wash is then applied to eliminate any underlying spores and prohibit further growth. 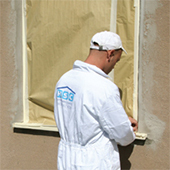 This process protects all doors, windows, paths and surrounding areas that are not being treated. This is achieved by masking up with tape, heavy duty paper, polythene and dust sheets. Whilst working we take great care to protect driveways and adjoining properties. Damaged render and decaying brickwork is removed and all cracks are chased out. 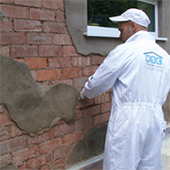 Fibre re-inforced, polymer-modified cements (GRC) are used for repairs to ensure a perfect bond Previously unpainted areas such as brickwork or pebbledash then benefit from a 'fairing' coat with polymer-modified render to fill small air holes and soften any brick lines.